In today’s article, we will be sharing few interesting things about how a soldering gun/iron is used while repairing a jewelry. Jewels are best friends of women and they can’t stay way from each other. Women, not only enjoy wearing expensive jewelry, but also like to take care of their jewels at any cost. However, there are various occasions where a jewelry needs a rework, repair and modification, and a soldering iron plays vital role in reshaping it. However, the regular soldering irons that are used for electronics work can’t be used for soldering jewelry because of the temperature differences in the jobs being undertaken. A regular solder job for electronics involves applying low temperature and a lead solder is used as a joining element. But in the case of soldering jewelry, lead can’t be used because it’s too soft and once applied to silver or gold, it can’t be removed. Interestingly, the process of soldering a silver or gold is called as brazing. Solder used in brazing needs to have it’s melting temperature close to that of gold or silver. Even the flux used in the job also of high temperature. We need to use silver solder for soldering silver, copper, brass and gold solder for soldering gold metal. Gold requires higher temperature compared to silver. 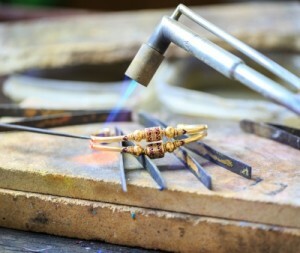 Instead of a soldering gun, a torch(such as Blazer GB2001) is used in soldering a jewelry. Torch uses gas to generate flame required for brazing (soldering of gold and silver). The common gases used are propane and MAPP (Liquefied petroleum gas + methyl acetylene-propadiene). A flux called borax flux ( Borax – Sodium Tetra borate) will be used for the easy flow of solder. Pokers are required to move metal pieces during soldering. Tweezers are needed for holding and positioning the metal pieces during the solder process. Most technicians use a pickling compound Solution for cleaning the metal surfaces (oxidized surfaces and flux) after the soldering work is finished. This solution can be made in home by adding 1 cup of vinegar plus 1 tea spoon salt. Though most of the times, women take care of their valuable jewels but some times, accidentally or due to wear and tear, their jewelry may break and end up damaging. That’s when a need of repairing the damaged jewelry arises and a soldering process comes into picture. How To Solder a Jewelry? Well, before we jump right into a video that explains the soldering setup for jewelry, let’s quickly summarize the steps that are followed during the soldering process. In fact, it needs lots of patience and eye to details. One needs to choose a good soldering equipment for achieving a decent solder. That’s all. Your job is done ! Caution: Make sure that you take safety measures such as wearing goggles and procuring the right soldering tools as mentioned above. Also make sure that you conduct the soldering job in a bright and ventilated area.